Washington: For the first time, a new study has revealed that a common species of seaweed, Laminaria Ochroleuca, is a rich source of bacteria with antimicrobial and anticancer activities - and potential new drug candidates. The research was published in Frontiers in Microbiology. Almost a century since Fleming discovered penicillin in a stray mould, scientists continue to look to microbes for new antibiotics and other medicines. To date, none has given more generously than the Actinobacteria: a family of soil- and seabed- dwelling bacteria who think they're fungi. "About half of the 20,000+ microbe-derived drug candidates currently known come from Actinobacteria," said senior study author Dr Maria de Fátima Carvalho. "Now the supply of new species on land - where they form spores and branched networks just like a fungus - is beginning to run out," added Carvalho. But relatively underexplored marine Actinobacteria may yet prove an even richer source of bioactive microbial molecules. "Several novel drug leads derived from marine Actinobacteria are already known. These include anticancer agent salinosporamide A, currently in clinical trials, and several new antibiotics that are effective against drug-resistant infections like MRSA and tuberculosis," said Carvalho. Predominantly found in sediments on the seafloor, Actinobacteria can also live inside other organisms that live and feed there - including brown algae (seaweed). "The brown alga Laminaria ochroleuca forms complex structures called kelp forests, which are among the most diverse and productive ecosystems in the world. But until now, no-one had characterised the Actinobacteria that live inside L. ochroleuca," said Carvalho. Carvalho's team analysed a sample of L. ochroleuca from a rocky shore off northern Portugal. "After six weeks of culture in the lab, we isolated 90 Actinobacterial strains from the sample," said, Carvalho. Seven of the extracts inhibited the growth of breast and particularly nerve cell cancers while having no effect on non-cancer cells. 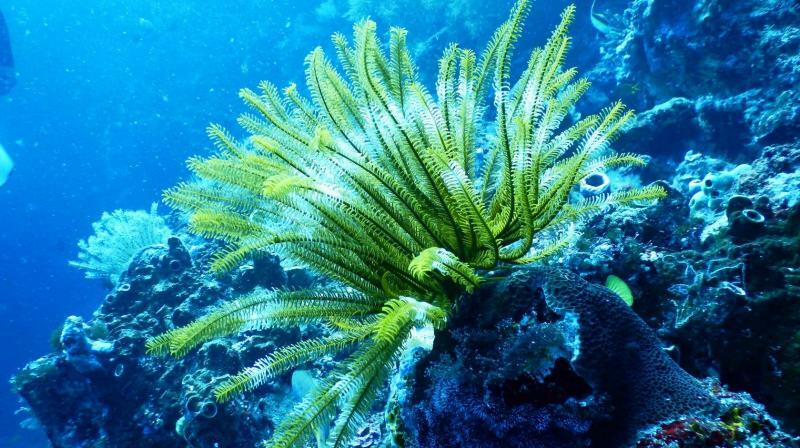 "This study reveals that the seaweed L. ochroleuca is a rich source of Actinobacteria with promising antimicrobial and anticancer activities," said Carvalho. Further tests on the most potent of these strains revealed that some of the effects are likely the result of newly discovered compounds. "We identified extracts from two Actinobacteria strains that do not match any known compounds in the most comprehensive international database of natural bioactive compounds. We intend to follow up on these exciting results," added Carvalho.